West Virginia let eight years lapse after the World's Columbian Exposition of 1893 without deciding on a flower or floral emblem to represent the state. Governor George Wesley Atkinson, near the end of his term in 1901, decided that it was time that West Virginia take action to declare an official floral emblem. "For a State Flower," he said, "I know none more beautiful and none more common in West Virginia, than the Rhododendron. It is found along most every vale and hillside, and is universally admired both for its beauty and fragrance." This prompted others around the state to join the state flower campaign and numerous personal favorites were nominated as potential floral representatives of the state. In 1902, the State Superintendent of Schools suggested that the question of a state flower be put to the students of the state. School children were frequently asked to become involved with the adoption of state flowers and today, students continue to take an active role in the designation of state symbols. A statewide referendum was finalized on November 26, 1902 when students expressed an overwhelming preference for the rhododendron. Big laurel won more than half (19,000) of the 36,000 votes cast posting solid backing in all West Virginia counties with the exception of Ohio County, where the goldenrod was favored. Following the landslide victory of big laurel, the flower was approved by the West Virginia Senate on January 23, 1903 and by the House on January 29, 1903 (House Joint Resolution No. 19). Big laurel is also called great laurel, great rhododendron, rosebay, and rosebay rhododendron. The big laurel was approved by joint resolution and is not recorded in the Code of West Virginia . Rhododendron maximum (Rosebay Rhododendron): University of Connecticut Plant Database of Trees, Shrubs and Vines. 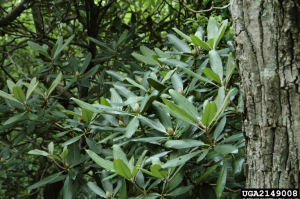 Great Rhododendron (Rhododendron maximum): Tree Identification Fact Sheet from the Virginia Tech. 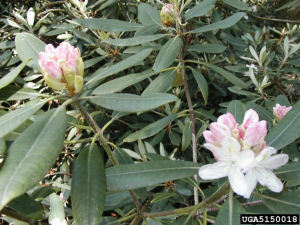 Plant Profile for Rhododendron maximum L. (Great Laurel): USDA, NRCS. 2004. The PLANTS Database, Version 3.5 (http://plants.usda.gov). National Plant Data Center, Baton Rouge, LA 70874-4490 USA. Description of Rhododendron maximum: from the American Rhodedendron Society.